The Flying Blue shop for Miles Website located at www.flyingblue.com/earnonline is proposed by AIR FRANCE and KLM and operated by Collinson Latitude. AIR FRANCE and KLM provide access to this site. AIR FRANCE and KLM provide a free service through the site to members of the Flying Blue Programme ("Members") that allows members to receive Flying Blue Miles ("Miles") for purchases of qualifying goods and services made at participating online stores ("retailers") when those purchases are made through the Site ("Website"). These terms and conditions are for the benefit of and are separately enforceable by AIR FRANCE and KLM. AIR FRANCE and KLM may at any time, publish and enforce any additional terms and conditions they feel necessary in relation to the operation of the Flying Blue shop for Miles Website. The allocation of Miles in relation to the purchase of goods and services on the Flying Blue shop for Miles Website is made in accordance with these terms and conditions, and any additional conditions published by or on behalf of AIR FRANCE and KLM from time-to-time through this Programme or through the Flying Blue terms and conditions available on FlyingBlue.com. These terms and conditions are subject to change and reference should be made to the applicable terms and conditions before purchasing. AIR FRANCE and KLM are not responsible for products and services offered by retailers for sale on the Flying Blue shop for Miles Website or the content or availability of any third party websites that link from the Flying Blue shop for Miles Website, including the websites of retailers. Anyone can access and browse through the Flying Blue shop for Miles Website. In order to earn Miles, you must be a Flying Blue Member, and be logged onto the Flying Blue shop for Miles Website to access the retailers' websites via links from the Flying Blue shop for Miles Website. You cannot earn Miles for purchases that you make prior to logging onto the Flying Blue shop for Miles Website. Miles may only be earned by purchasing goods and services from retailers at the Flying Blue shop for Miles Website from the date that the retailer becomes available at the Flying Blue shop for Miles Website. Miles may not be redeemed for the purchase of goods and services through the Flying Blue shop for Miles Website. 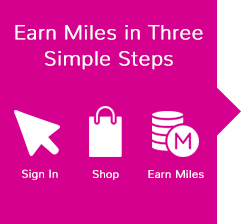 Miles earned from purchases will be credited to the user's Miles account. Miles can not be earned from purchases made directly with a retailer. You must log on to the Flying Blue shop for Miles Website through your Miles account and visit a retailer's website from the Flying Blue shop for Miles Website prior to making a purchase. Miles will be credited to your Miles account within 48 hours after your purchase has been approved by the retailer to AIR FRANCE and KLM. It takes 45 days for a retailer to acknowledge and approve purchase and 90 to 120 days after you've completed your stay for hotel or travel bookings. Where there is any exceptional delay on the part of the retailer, this is not something for which AIR FRANCE and KLM are liable but AIR FRANCE and KLM will use all reasonable endeavors to credit the Miles to your Account with minimum delay. Your purchases are tracked and reported back to AIR FRANCE and KLM by the Retailer. AIR FRANCE and KLM are not responsible for any errors or delays in reporting transactions. AIR FRANCE and KLM will, however, use all reasonable endeavors to ensure correct reporting by retailers though we cannot accept liability if they fail to do so. Should a retailer delay payment or cease trading, AIR FRANCE and KLM will make every effort to recover your Miles however we make no guarantees until funds have been received from the retailer, their agents or any party acting on their behalf. AIR FRANCE and KLM may stipulate the calculation of Miles per Euro spent or allocate fixed Miles in relation to activity at the Flying Blue shop for Miles Website. AIR FRANCE and KLM may at any time, vary the method or procedure for the calculation of Miles. The amount of Miles earned on your Flying Blue shop for Miles Website transactions will be credited to your Miles account. You can check your mileage balance by logging on to Your Account under AIR FRANCE or KLM. Following a purchase, Miles earned will be posted as "Pending" by the retailer. Once the purchase is approved by the corresponding retailer, Miles will be credited to Member's account within 48 hours. Pending and approved transactions are the sole responsibility of the retailer from whom a purchase is made. AIR FRANCE and KLM do not warrant any time frame for the approval of a purchase through the Flying Blue shop for Miles Website. If a purchase is cancelled or goods are returned to a retailer, the pending Miles allocated for the purchase will be cancelled. The pending Miles will then be cancelled in your Flying Blue account. Once transactions have been approved, Miles will be transferred to your Miles account. Member returned the product to the retailer or cancelled their service. Member last clicked to the retailer's website didn't come from Flying Blue Earn Online. Member used a promotional discount voucher to make their purchase and that voucher was not found on SkyMiles Shopping Asia Flying Blue Earn Online. Member used a 'refer a friend' or similar type incentive by the retailer. Member already had items in the retailer's shopping basket and did not start a fresh session when making their purchase. Member cleared their cookies/web history before making their purchase or has some kind of pop-up/ad blocking software that can affect tracking. Member's new registration with the retailer has not be deemed as genuine by the retailer. Member's payment failed or didn't meet the requirements of the retailer's credit check. Member completed or modified their purchase by telephoning the retailer. Member's purchase didn't meet the retailer's Terms & Conditions. Should AIR FRANCE and KLM suspect fraudulent or suspicious activity in relation to your Miles account, AIR FRANCE and KLM may place your account on hold or suspend transactions. In the case of any failure by Member to follow these Terms and Conditions or any other fraud or abuse related to the Programme, including but not limited to your engaging in a pattern of returning or cancelling products or services after the corresponding Miles have been credited, as determined by us in our sole discretion, we and our partners reserve the right to make any adjustments to your Account at any time and to take appropriate administrative or legal action. In such a case, some or all of your Miles earned through the Programme may be forfeited. Members that choose to access the Flying Blue shop for Miles Website do so at their own risk. AIR FRANCE and KLM are not responsible for any failure in communication between AIR FRANCE and KLM, retailers, or you. Protect your private information in public areas by logging out and closing all browsers once you've finished browsing the Flying Blue shop for Miles Website. Where permitted by law, AIR FRANCE and KLM excludes liability to you for any direct or indirect loss, damage or expense arising from your use of the Flying Blue shop for Miles Website – regardless of whether the same arose from negligence, breach of contract or otherwise, and regardless of whether or not AIR FRANCE and KLM have any control over circumstances in relation to the claim. All information and data displayed on the Flying Blue shop for Miles Website by AIR FRANCE and KLM or retailers is offered for informational purposes only, and is binding only to the extent that the contents of any such information or data are expressly incorporated in writing in these terms and conditions. All purchases of goods and services at the Flying Blue shop for Miles Website will be subject to the terms and conditions of the retailer from which they are purchased, including, and not limited to delivery and return policies. If you have any questions or complaints regarding your purchase you must contact the retailer directly. Warranties, if any, are provided by retailers and not AIR FRANCE and KLM. AIR FRANCE and KLM accepts no liability for defects in the quality or condition of goods and makes no claims or warranties as to the delivery of goods or services to the extent permitted by law. Miles will not be awarded on the purchase of gift vouchers or purchases made using gift vouchers, which for avoidance of doubt includes gift cards, gift certificates or on VAT, sales, use, excise or other applicable taxes, and delivery charges. Any links to other websites are provided merely as a convenience to the users of this Site. AIR FRANCE and KLM has not reviewed all of these other websites, has no responsibility for the content of such other sites, shall not be liable for any damages or injury arising from any such content, and does not endorse or make any representations about these websites, any information or other products or materials found there, or any results that may be obtained from using them. If you decide to access any of these other sites linked to this Site, you do so entirely at your own risk. The proposal, presentation, purchase, sale, and distribution of goods or services are transactions conducted by the Retailers with the user of the Website. TO THE EXTENT PROVIDED BY LAW, AIR FRANCE AND KLM AND ITS AFFILIATES, DIRECTORS, AND EMPLOYEES DISCLAIM ANY AND ALL WARRANTIES AND LIABILITY FOR SUCH TRANSACTIONS, GOOD, AND SERVICES SINCE THESE ARE CONDUCTED WITH AND PROVIDED BY PARTIES INDEPENDENT OF AIR FRANCE AND KLM. THE USER OF THIS SITE ACKNOWLEDGES SUCH DISCLAIMER. IN NO EVENT WILL AIR FRANCE AND KLM OR ITS AFFILIATES, DIRECTORS, AND EMPLOYEES BE RESPONSIBLE FOR INDIRECT, SPECIAL, INCIDENTAL, PUNITIVE OR CONSEQUENTIAL DAMAGES REGARDLESS OF THE BASIS OF THE CLAIM AND WHETHER OR NOT IT WAS ADVISED OF THE POSSIBILITY OF SUCH DAMAGES. FURTHER, TO THE EXTENT PROVIDED BY LAW, AIR FRANCE AND KLM AND ITS AFFILIATES, DIRECTORS, AND EMPLOYEES DISCLAIM ANY AND ALL WARRANTIES AND LIABILITY FOR SUCH TRANSACTIONS, GOOD, AND SERVICES SINCE THESE ARE CONDUCTED WITH AND PROVIDED BY PARTIES INDEPENDENT OF AIR FRANCE AND KLM. THE USER OF THIS SITE ACKNOWLEDGES SUCH DISCLAIMER. IN NO EVENT WILL AIR FRANCE AND KLM OR ITS AFFILIATES, DIRECTORS, AND EMPLOYEES BE RESPONSIBLE FOR INDIRECT, SPECIAL, INCIDENTAL, PUNITIVE OR CONSEQUENTIAL DAMAGES REGARDLESS OF THE BASIS OF THE CLAIM AND WHETHER OR NOT IT WAS ADVISED OF THE POSSIBILITY. Any information provided by you in connection with use of the Site: (a) shall not be false, inaccurate or misleading; (b) shall not be obscene or indecent; (c) shall not contain any viruses, Trojan horses, worms, time bombs, spiders, or other computer programming routines that are intended to damage, detrimentally interfere with, surreptitiously intercept or expropriate any system, data or personal information; (d) shall not infringe on any AIR FRANCE and KLM or third party's copyright, patent, trademark, trade secret or other proprietary rights or rights of publicity or privacy; (e) shall not be defamatory, libellous, unlawfully threatening or harassing; and (f) shall not create liability for the Site or cause us to lose the services of our Internet service providers or other suppliers. You may not take any action that imposes an unreasonable burden upon the infrastructure used to support the Site, including but not limited to unsolicited e-mail, also called spam. We periodically schedule system downtime for maintenance and other purposes. Unplanned system outages also may occur. AIR FRANCE and KLM shall have no liability whatsoever for the resulting unavailability of the Site or for any loss of data or transactions caused by planned or unplanned system outages or the resultant delay, mis-delivery or non-delivery of information caused by such system outages, or any third party acts or any other outages of web host providers or the Internet infrastructure and network external to the Site. Should any user respond to AIR FRANCE and KLM, any of its employees, agents, partners, or others through the Site, via e-mail, message boards, or otherwise, with any information including, but not limited to, feedback, questions, requests, opinions, comments, suggestions, or the like regarding the content of the Site, or services or any other information ("User Feedback"), such information shall be deemed to be non-confidential and AIR FRANCE and KLM shall have no obligation of any kind with respect to such information. AIR FRANCE and KLM shall be free to reproduce, use, disclose and distribute the information to others without limitation and shall be free to use any ideas, concepts, know-how or techniques contained in such information for any purpose whatsoever to the extent not prohibited by law. You acknowledge, consent and agree that as operator of the Site, AIR FRANCE and KLM may access, preserve, and disclose User Feedback if required to do so by law or in a good faith belief that such access preservation or disclosure is reasonably necessary to: (a) comply with legal process; (b) enforce the Agreement; (c) respond to claims that any User Feedback violates the rights of third-parties; (d) respond to your requests for customer service; or (e) protect the rights, property, or personal safety of the Site, its users and the public. This Agreement and access to/usage of the Site shall be governed by and construed in accordance with the laws of France. This Site does not knowingly collect any personal information from children under the age of 13. If you are under 13, you agree that you will not provide personal information about yourself to us through the Site. UNDER NO CIRCUMSTANCES SHALL AIR FRANCE AND KLM, THEIR PARTNERS, CONTRIBUTORS, AGENTS, EMPLOYEES, OR ANY OTHER PARTY INVOLVED IN CREATING, PRODUCING, OR DISTRIBUTING THE SITE BE LIABLE FOR ANY DIRECT, INDIRECT, INCIDENTAL, SPECIAL, OR CONSEQUENTIAL DAMAGES FOR LOSS OF PROFITS, GOODWILL, USE, DATA OR OTHER INTANGIBLE LOSSES (EVEN IF WE HAVE BEEN ADVISED OF THE POSSIBILITY OF SUCH DAMAGES) THAT RESULT FROM: (I) THE USE OF OR INABILITY TO USE THE SITE; (II) ANY INACCURACIES OR OMISSIONS IN THE CONTENT; (III) USE OF THE CONTENT; (IV) THE COST OF PROCURING SUBSTITUTE MERCHANDISE, ADVICE AND SERVICES RESULTING FROM USE OF THE SITE; (V) UNAUTHORIZED ACCESS TO OR ALTERATION OF YOUR TRANSMISSIONS OR DATA; (VI) STATEMENTS, ADVICE, WARRANTIES, GUARANTEES OR CONDUCT OF THE AIR FORCE ASSOCIATION. YOU HEREBY ACKNOWLEDGE THAT THIS PARAGRAPH SHALL APPLY TO ALL CONTENT, ADVICE, MERCHANDISE, GOODS AND SERVICES AVAILABLE THROUGH THE SITE. IN NO EVENT SHALL AIR FRANCE OR KLM TOTAL CUMULATIVE LIABILITY UNDER THESE TERMS EXCEED THE LESSER AMOUNT OF ANY FEES PAID TO THE SITE, IF ANY, FOR THE USE OF THE SITE BY YOU OR $1.00. BECAUSE SOME STATES MAY NOT ALLOW THE EXCLUSION OR LIMITATION OF LIABILITY FOR CONSEQUENTIAL OR INCIDENTAL DAMAGES, IN SUCH STATES LIABILITY IS LIMITED TO THE LEAST AMOUNT PERMITTED BY LAW. THE LIMITATIONS OF LIABILITY PROVIDED IN THIS AGREEMENT INURE TO THE BENEFIT OF AIR FRANCE AND KLM, AND THEIR AFFILIATES, PARTNERS, CONTRIBUTORS, OFFICERS, DIRECTORS, EMPLOYEES, ASSIGNS, ATTORNEYS AND AGENTS. We may immediately issue a warning, suspend or terminate your access to the Site for breach of this Agreement (or any other agreement or policy incorporated by reference hereto), or for any other reason in our sole discretion.